Slice a lemon in half. Prepare an empty and clean cup; preferably from glass. 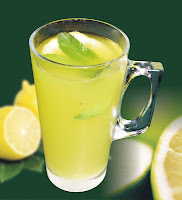 Take saw-knife or fork, and grind the flesh of the lemon into the cup. Make sure you turn the lemon towards the cup, so you do not spray nor leak beyond the edges. Juice will flow - maybe some seeds as well. No worries, for the seeds drop to the bottom.